Let Capt. Ponytail take you on a fishing adventure of a lifetime. You'll fish the Roanoke River for Striped Bass or the backwaters of Winyah Bay and North Inlet for Red Drum, Trout, Floounder, Tarpon and Shark. Here's some of the emails I've received from folks about their fishing adventures with me. What a fabulous weekend. Although Saturday was a little slow, we made up for it in an epic half day fish on Sunday November the 1st. The four of us were catching large redfish one after the other, and on several occasions we had 4 hookups at one time. We lost count as the fishing was fast and furious over a 3 hour period but our best estimate was that we caught over 40 redfish that morning. We were some tired puppies. Really enjoyed fishing the light tackle for part of the time as I caught quite a few with the light rod and several times had a double hookup with that rod and the rod I was “guarding” in the rod holder. I honestly can’t imagine anyone catching more fish than we did in those few hours. This will have to go on the bucket list such that I can cross it off. Thanks for a great adventure. Rod is a great guy to fish with - and I would say that even if we hadn't caught 40+ redfish on 11/1. He had a personality that makes you feel like you've known him all of your life and he tells great, interesting stories that make the day go by faster when the fish aren't biting. That being said, our fishing trip with Captain Ponytail was average on our Saturday leg - in part because of windy conditions which led to rough water conditions. But our half day trip on Sunday - WOW!!!! - what a great day fishing. Once we anchored we started catching fish almost immediately and did so for four hours straight! With barely enough time between bites to catch our breath. I dare say it was the redfishing trip of a lifetime!!! I might could have as good of a day fishing at some point again in my lifetime but I'll never have any better day! That's how truly good it was. What a great day we had on the water Saturday! From the morning bite to the late afternoon bite, we saw an abundance of fish and caught and released our fair share. Realing in 30-45 inch Drum on the inside was amazing. This made it very memorable for Sam and I. Thanks for the knowledge you shared on the water and an overall memorable day. Can't wait to spend time with you on the Roanoke this spring (or maybe sooner). I just wanted to drop you a line and tell you what a great time we had fishing with you on the Pamlico. It was a blast seeing 10 year old Noah reel in a 50lb. fish. 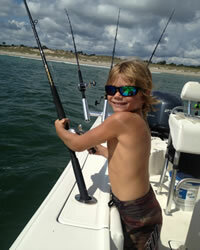 He had a ball, and I must say he was one tough kid considering the 25 mile per hour winds and the 6 foot seas. I'm really impressed with your knowledge of the waters considering this is you first year down there. I'm counting the days till you get back to Winyah Bay and we do it all over again. Thanks again for a great fishing trip August 7th. We appreciate the preparation and working hard to keep our lines in the water. Attached are some links to a couple videos I just posted of the trip. What a blast! I hope someday to get back there and go again, next time for a full day. Take care. Watch this video of us catching a giant red drum with Capt. Rod in Winyah Bay! Watch this video of us catching a bonnethead shark with Capt. Rod in Winyah Bay! My name is Bobby Courtney and I recently fished with Captain Rod in Georgetown. This is the fifth trip with him either on the Roanoke or at Georgetown. I have fished and hunted with guides from the Keys in Florida to Virginia and Arkansas and I have never been treated better or had more fun than with Captain Rod. This guide works hard to get you the fish and makes you feel like he's known you for years. If you want to have a great fishing trip call this man. And Captain Rod I will be in touch soon to book a trip for the really big spot tails in N.C. In August or September. Rod, what a special day again, You are the consummate professional but most of all, a great friend. I appreciate you sharing the day with our buddies from Atlanta, Chapel Hill and Charlotte. We may see you again in May, my wife, Daniel and I may see you on the 13th of May. My name is Terry Boyce and I am the Director of a non-profit organization named Dream Hunt & Fishing Program. The Dream Hunt & Fishing Program is a wish granting service for youth with Life Threatening Diease/Illness or a Disabling Physical Handicap. These youth have Dreams of going Hunting, Fishing or just enjoying the wildlife and the great outdoors. The program is not just about the taking of wildlife. Wanted to say thanks for a great day on the water. We really had a blast and the kids were ready to go back out there as soon as we left to go home. I attached all the pictures from yesterday. I think Tommy and I were interested in the fall redfish fishing and we will be in touch with you about that. Just got home from a great trip with Captain Ponytail today!! My kids had the time of their lives reeling in 10-12# Stripers! Thanks Rod, we had a blast! Just wanted you to know how much fun the gang had!! It was a lot more than any of us imagined it could be. It was the best day of fishing weve ever had!! Smith, Parsley & McWhorter, P.A. We had a wonderful fishing trip. Thanks for making it so. We floated water we had never been on, we caught fish, we saw eagles, and we made new friends. It don't get any better than that. Lord willing, you will be taking us again next year.